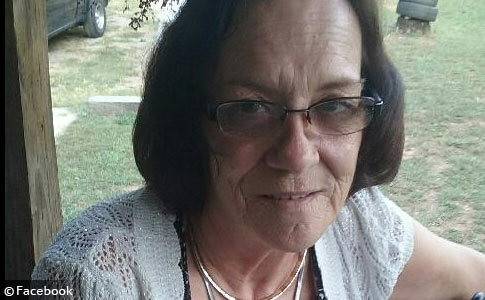 Kathy Sue Nichelson, 61-years old, was killed by a pit bull while visiting the owner's home. UPDATE 10/05/17: According to an official statement by the Gilmer County Sheriff's Office, the owner of the pit bull that attacked and killed 61-year old Kathy Nichelson last Thursday has been arrested and faces two criminal charges. "Today, Detectives with the Gilmer County Sheriff’s Office have taken Dante Holloway into custody. He has been booked into the Gilmer County jail and is charged with Involuntary Manslaughter and Reckless Conduct," states the sheriff's release. "The arrest is a result of the investigation into the death of Ms. Kathy Nichelson by a Pit Bull owned by Mr. Holloway. His bond is $50,000 for both charges," the release continues. We are uncertain at this time if the involuntary manslaughter charge is a felony or misdemeanor -- Georgia has both. Reckless conduct is a misdemeanor punishable by up to 12 months in jail and a $1,000 fine. Several days ago, the Times Courier reported this dog had "some issues" in the past. (16-5-60) A person who causes bodily harm to or endangers the bodily safety of another person by consciously disregarding a substantial and unjustifiable risk that his act or omission will cause harm or endanger the safety of the other person and the disregard constitutes a gross deviation from the standard of care which a reasonable person would exercise in the situation is guilty of a misdemeanor. Late Friday, a local news group released the incident report and the arrest report. The second victim, who tried to give aid to Kathy Nichelson, was identified as Morgan Fountain. He suffered a facial bite by the dog. Sgt. Jason Newman was first to arrive on scene. He described the dog as having a "black and white face," and had "red all over its mouth and head area." Once fire units arrived, Newman and another deputy stood watch for the dog; it was later fired upon and killed. 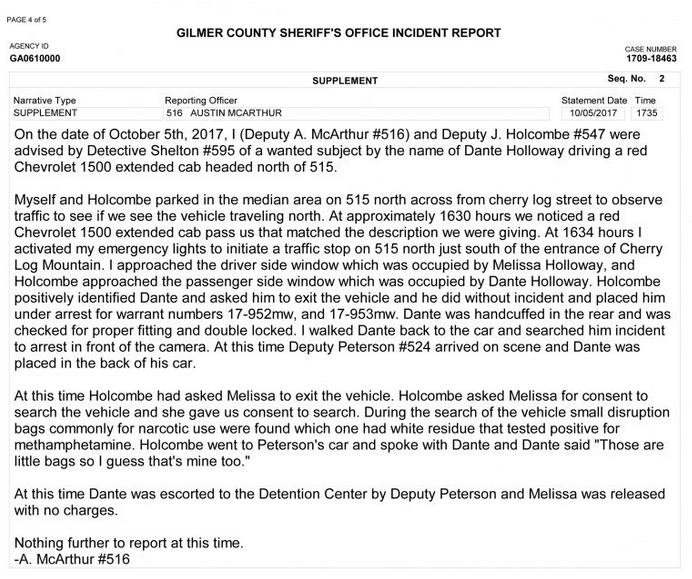 The arrest report shows that two deputies stopped Dante Holloway and his wife on October 5 as they drove on 515 North. Dante exited the vehicle without incident and was placed under arrest. He was handcuffed and placed into the back of a police cruiser. Holloway's wife, Melissa, also exited their vehicle and gave consent to search it. Deputies found small bags commonly used for narcotic use in their search. One had white residue that tested positive for methamphetamine. Multiple Vicious Dogs in Household? Meanwhile, on the related Facebook post by the Gilmer County Sheriff's Office, locals continue to claim the attacking pit bull had a history of bites over the years. Authorities have not confirmed this. 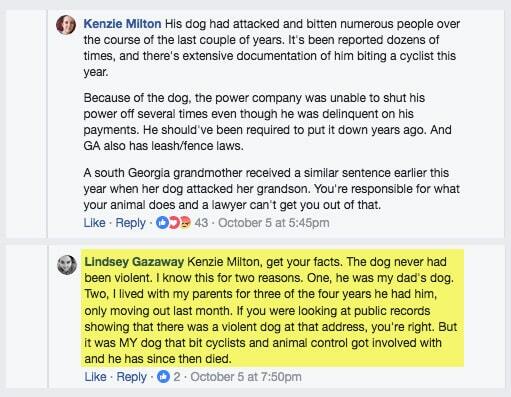 A person claiming to be Holloway's daughter, Lindsey Gazaway, states, "If you were looking at public records showing that there was a violent dog at that address, you're right. But it was my dog that bit the cyclists and animal control got involved." He has "since then died," she wrote. 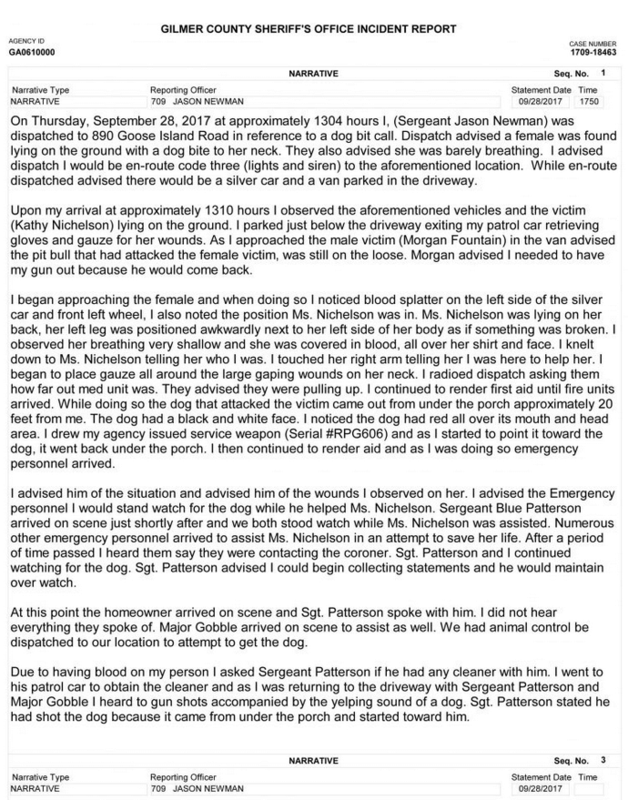 On Thursday, the Gilmer County Sheriff's Office issued a press release stating that a 61-year old woman died after being attacked by a dog. Very few other details were released. The Cherry Log community is about 80 miles north of Atlanta. 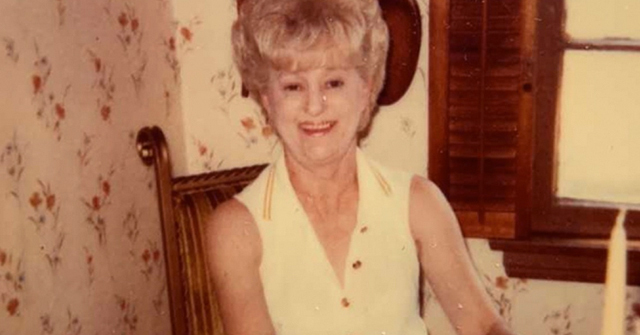 Police later identified the victim as Kathy Sue Nichelson and confirmed that she died after being attacked by a pit bull on Goose Island Road. A second person was injured trying to help the victim. Deputies shot and killed the vicious animal. Today, WXIA revealed Nichelson was a great-grandmother. The injuries the pit bull inflicted were so punishing, she will have a closed casket, as is usually the case after a fatal pit bull mauling. During the 911 call, dispatch asks, "Is she able to talk or anything?" The person replies: "No she's not because she's barely breathing. He bit her neck really bad." Nichelson had stopped by a friend's home. 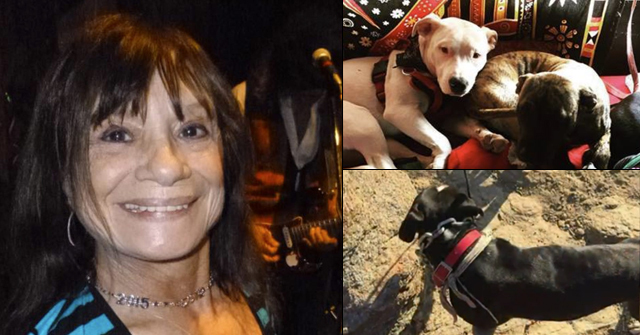 When she exited her vehicle, her friend's pit bull savagely attacked and killed her. 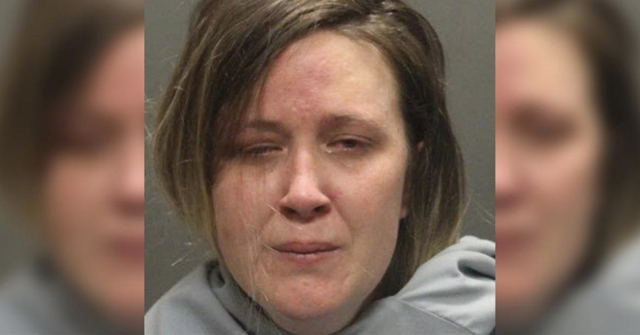 Nichelson's daughter, Candy Smith, said she tried to fight the dog with a knife, but she was no match for the animal. A passerby saw Nichelson lying on the ground after the mauling. He ran to give her aid, not knowing about the dog. The pit bull then reappeared and attacked him. 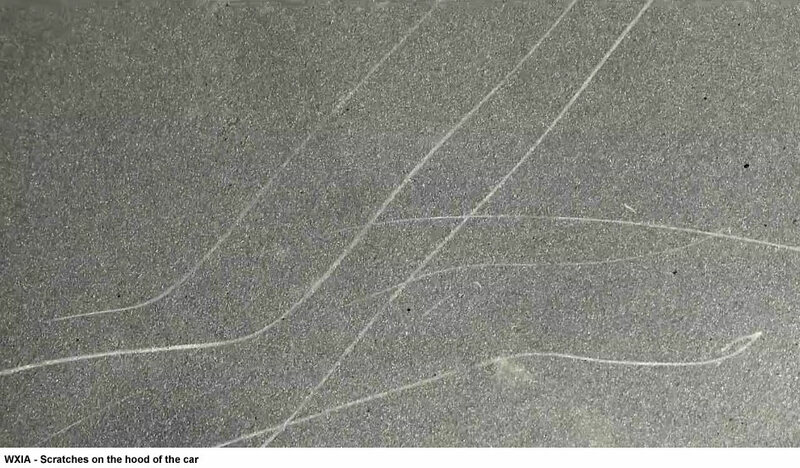 One or both victims managed to climb on top of Nichelson's car. "The dog literally scratched the paint off of the hood of my mom's car trying to get to them," Nichelson's youngest daughter told WXIA. After deputies arrived they barricaded the pit bull, but it broke free, apparently not finished with its "rampage" attack. Deputies fired on the animal, killing it. "To be brutally, brutally murdered like that, nobody, nobody deserves that," the youngest daughter told WXIA in a shaky voice. Yet, after the emotional shock and horror of this vicious, deadly attack, family members told WXIA they "don't blame the breed of dog," but rather the owner. Police have not identified the owner of the pit bull. In January 2016, one of the victim's granddaughters, Deanna Melville, reflected a similar view of "not blaming the breed." 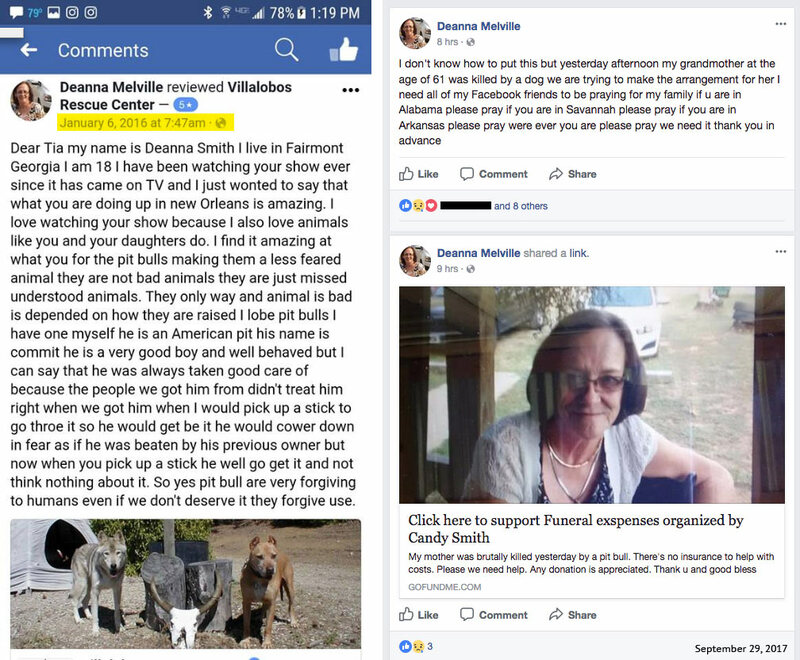 On a public Facebook post Melville left at Villabolos Rescue Center, she praised Tia Torres of Pit Bulls and Parolees for helping the "missed understood animals" [sic] and the "only way and animal is bad is depended on how they are raised" [sic]. Melville also stated that she owned an American pit bull, named "Commit." It's unclear if Melville still owns the pit bull. After further examination (kudos to the hot tipper who sent this in! 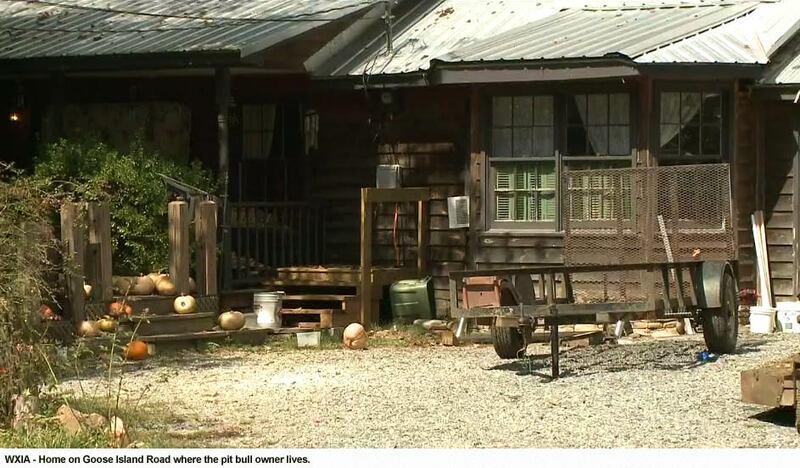 ), we see that daughter Candy Smith is also a pit bull owner. We pulled these comments from the Gilmer County Sheriff's Office Facebook post. "I don't blame the breed as I have a pit. I blame the owner," Smith states. Smith also blames the Good Samaritan who came to her mother's aid. "He was only worried about himself," she states. People like Candy Smith help ensure that these horrific maulings continue. 01/19/17: 2017 Dog Bite Fatality: Pit Bulls Kill Child, Critically Injure Another Child in Atlanta. "Don't blame the breed," says the family of the deceased. Dang that pit bull propaganda makes some fine brainwashing. Pit bull apologists: blame the owner, not the breed, because it's how they're raised. But then do their best to save dogs from busted fighting rings and stuff so they can be adoped out, when those dogs had the worst upbringing possible. Nutter logic for ya. One other thing, lately I have been seeing nutters comment that bites are down, in the face of all evidence. Looks to me like both bites and deaths are skyrocketing. This has been a bad year:'-( Thanks, all you guys trying to educate people. The less future victims, the better. I've said it a hundred times-NEVER go to a home with a pit bull no matter how 'sweet' the idiot owner insists it is. Don't let your loved ones or children go either. "… family members told WXIA they "don't blame the breed of dog," but rather the owner." 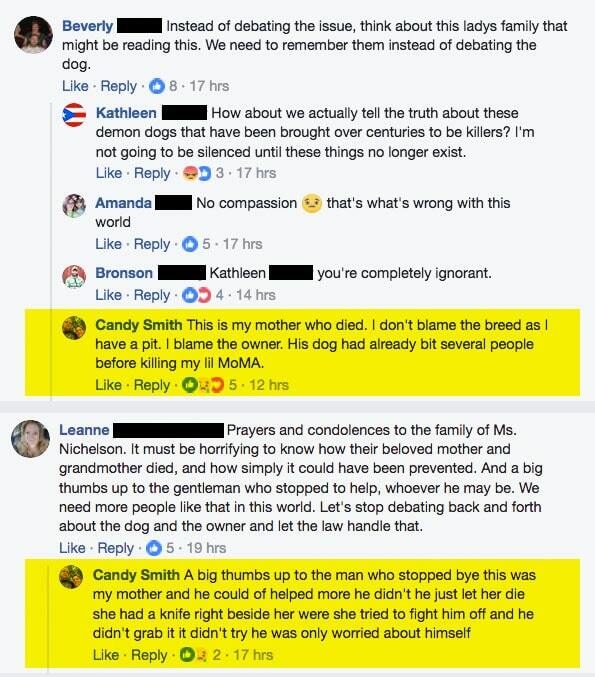 "… the "only way and animal is bad is depended on how they are raised …"
As long as people have that mindset they'll never figure things out, even if pit bulls were killing 1,000 people per year in the U.S. As long as they believe personal anecdotes over statistics they won't understand the danger they're putting family, friends, and neighbors in. It's always going to be a surprise to them when their dog attacks someone because they live in a state of denial. Why isn't the state doing something about this? Oh, that's right. There's too many people in government positions that put their own feelings over facts. Meanwhile they ignore all the babies and children that are being mauled and killed every year. No, we wouldn't want to ban some breeds. That would be racist. Are you serious?!!! Forget BSL. We need OSL – Owner Specific Legislation. "No person or persons shall own a pit bull or pit bull type dog if said person meet one or more of the following criteria : lives in a trailer, lives in the inner city, has a criminal record, has an IQ lower than 95, fails to grasp basic English, fails to use proper punctuation, has children, has neighbors within 1 mile, can't spell "bred", can't spell "definitely", can't afford an insurance policy less than one million dollars, smokes marijuana, uses any illegal drugs, drinks Budweiser, wears tank tops, or has a job that is funded by tax payer dollars." That should take care of about 98% of current pit bull owners, including the soulless sack of dung who, in the face of the violent death OF THEIR OWN MOTHER, continues to push pro pit bull s**t. Unbelievable. The depravity of those people is mind blowing. Beyond mind blowing. It's not even in the realm of normal brain function. Blaming an innocent man who tried to help this woman? Definitely. Blaming the canine spawn of satan who was displaying its genetics? Never! And pit wackos call the realists "ignorant". The irony is painful. Candy Smith is a HORRIBLE person to blame the Good Samaritan for her mom's death. Forget that it was that man who was there BESIDE Candy fighting this dog. Both of them ended up on the car roof and Candy takes no blame but blames this unrelated person who stopped, tried to help, and got attacked himself. What a loser nutter! Oh my god, she is blaming the Good Samaritan! I don't know how I missed that part. Unbelievable, just unbelievable! 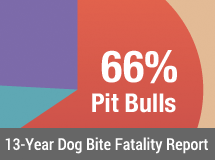 I have to say it, there have been some recent PBRF (pit bull related fatalities) on this site in which the family memebers are quick and vocal to defend the breed. This denial–it is like a true mental illness. I am just so mystified by this. Chris Becker, you make a good point. And I'm going to expand on it by saying that there's quite a bit of untreated mental illness among dog owners. Think of the people you've met who are so wrapped up in their dogs that they've forgotten how to relate to people. Or maybe they never did have this skill. To be honest I wouldn't blame my favourite breed (border collie) if a family member was killed by one. Very few border collies fatally maul people so I would think the rare times that it happens it must be a combination of factors (bad breeding, bad training, bad management, and bad luck). I'd definitely blame the owner unless the dog was in my care and control at the time (in which case I'd blame myself). I'm not sure how pit bull owners can ignore the statistics and breed purpose / breed characteristics but it seems they have no trouble doing so. Maybe their love for their own dog blinds them to the traits and tendencies that make them potentially so dangerous? Some people do say love is like a mental illness, and crazier things have been done in the name of love. I don't believe all pit bulls are bad dogs – many of them just carry genetic traits that are out of place in modern society. It's possible for a very conscientious, careful owner to keep them and have no problems but unfortunately most people are not that careful or considerate, and sometimes even with the best owners freak events or accidents happen (a storm blows down a fence / a burglar breaks a window and the dog gets out etc). I'm in favour of banning (or regulating) all the molosser breeds but I appreciate this wouldn't go down well with the majority of the dog owning population, especially considering GSD are mostly genetically molosser (according to genomics studies) and GSD are one of the most popular dog breeds. Everytime this happens, they ALWAYS say it's the owner's fault. It's time to start prosecuting owners. So, then there will be court cases on paper. And, when all the owners happen to be pitbull owners, the FACTS WILL SPEAK FOR THEMSELVES. It can't be blamed on MEDIA BIAS anymore. Lucu Lencia, for certain breeds and types of dogs being conscientious and careful isn't always enough. Every year several pit bull owners of the good hearted and well-intentioned variety–or one of their neighbors or parents or children–end up in the news because they were killed by well-raised and cared for pits. Some dogs were bred to kill rats, some were bred to pull sleds for miles, some were bred to kill. Why the surprise when they do the very thing that they were bred for? Most of the time their love for their owners wins out and everything is fine, but sometimes something happens that causes their fighting ring instincts to kick in. It's not their fault they were bred this way, but that's how it is. The fact that a small number of breeds are responsible for so many deaths every year, no matter how well they are raised, shows that nurture is only part of the story. Nature matters too. Lucu Lencia, your border collie would never be banned for aggression because that's not something that BC's were bred for. While they have their own issues (high energy dogs that can be destructive if left with no outlet, or job to do), killing and horribly mauling people are not their problem. You made a good choice when you chose your pet. That's one of the things that bothers me about pit owners. They could have chosen any breed of dog, yet they chose one that was bred to attack and kill without warning or provocation. Lucu: These dogs were bred for centuries to be the ultimate canine killing machine, you can't get that out with a few bellyrubs. Most pits that kill were family pets, well treated with no signs of abuse or neglect EVER. Only a very few pits who've killed had shady histories. Just go to fatalpitbullattacks.com and read their stories- their owners *shocked* at the sudden but predictable carnage by a breed designed for EXACTLY that. ALL pits carry traits that are out of place in society and make them UNFIT to be PET animals, including the bite strength of an industrial hydraulic press, tendency to go off without warning or provocation, and inability to stop until they are DEAD. What gets me is I'm seeing more and more of these killer dogs out in public. Parks, in cars with the windows open in public places, parading around stores apparently as "service" dogs. I've taken to carrying around a pit bull break stick. I don't know how effectively I could use it in a full fledged attack, but I figure it's better than nothing, given that it's becoming more and more impossible to avoid pit bulls in the public arena.